Back in India, I have never used parsley. Though available, I guess its popularity is obscured by the more commonly used herbs like mint, cilantro and curry leaves. I just knew it as a mouth freshener and a garnish. But here in Kuwait I noticed it being frequently served as a salad. 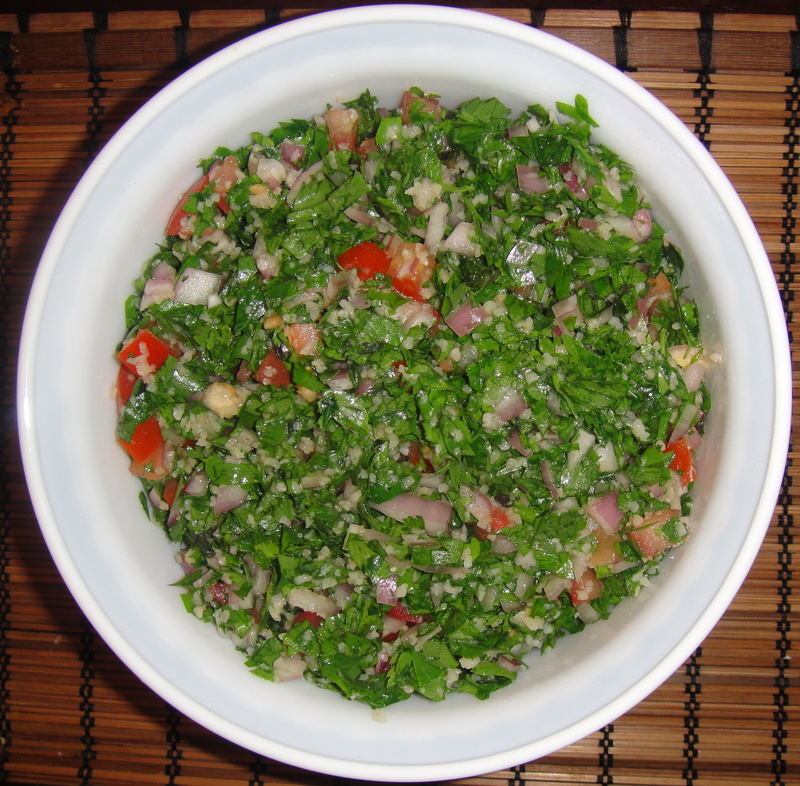 Tabbouleh, the salad is Lebanese in origin and tops all parsley recipes. What started as an argument between me and my husband about the off-white ingredient in the dish led us to dig into the recipe. My guess was that it was coarsely ground peanuts soaked in water whereas my husband thought that it was grated coconut flower. None of us was right as we later discovered that the stuff in question was “Burghul”(parboiled, dried and ground wheat). By then we had familiarized ourselves with the recipe and the easy obtainability of all the items required encouraged us to try our hands at it. The recipe is easy peasy. Destem the parsley; swish the leaves in a bowl of water; repeat the process twice or thrice to get rid of all the impurities sticking to the leaves; thoroughly drain the water from the leaves; chop the leaves as finely as you can – I sometimes use scissors for this. Soak burghul in hot water for about half an hour so that it absorbs water and swells. Remove the burghul from water and press it with a ladle to drain away the water from the grains. Deseed the tomato; chop it finely. If you notice, efforts have been taken to remove elements that may contribute to sogginess. The goal is to retain the crispness of the parsley leaves to impart a better textural effect to the salad. And don’t ever add the parsley stem as it has a different flavour altogether and changes the taste of the end product. Add all ingredients one by one to a bowl, squeeze the juice of the lemon on to them, sprinkle olive oil, add salt to taste and mix them gently. Refrigerate for about 15 min and allow the flavours to infuse before you serve. Now, you can call yourself the maker of an authentic Arabic dish. Parsley is a storehouse of volatile oils and flavanoids. Among its volatile oils, myristicin is antitumorigenic and chemoprotective. It helps neutralize particular types of carcinogens like the benzopyrenes that are part of cigarette smoke and charcoal grill smoke. Among its flavanoids, luteolin acts as an antioxidant and protects against free radical damage. It is also a rich source of vitamin K, beta carotene, vitamin C and a good source of folic acid and iron. Vitamin K helps in the synthesis of osteocalcin and sphyngolipid. The former is a protein that strengthens bones and the latter a fat that maintains myelin sheath around nerves. The vitamin has a role in blood clotting and it prevents calcium build up in tissues that lead to heart diseases. Beta carotene on conversion to Vitamin A in the body maintains the integrity of mucous membranes and epithelial linings and boosts the immune system. Vitamin C helps in the synthesis of collagen-the main structural protein in connective tissues and promotes wound healing. Folic acid ensures proper cell division, prevents neural tube defects and cancer of colon and cervix. It converts homocysteine into harmless molecules and wards off heart ailments. As we all know, iron helps in keeping anaemia at bay. Needless to say the dish also has anti-carcinogenic lycopene of tomato, anti-microbial thiosulphinates of onion, dietary fiber of burghul, digestion favouring menthol of mint, anti-scorbutic (scurvy preventing) vitamin-C of lemon and antioxidants of virgin olive oil. The salad serves as an excellent intermediary snack. And come on, do I have to add more to make you try this!!! Parsley fares in the “forbidden foods” list of kidney and gall bladder patients because of its oxalate content. Posted in Salads and tagged Burghul, Lebanese Salad, Middle Eastern Salad, Parsley, Parsley Salad, Tabbouleh, Tabouli. Bookmark the permalink.